Autumn in Chicago means football, sweaters and a punk rock music fest. Now in its seventh year, Riot Fest is one of Chicago’s more unique music festival in that not only is it dedicated to punk rock but it takes place in music venues all across the city. This year’s incarnation, now dubbed the Red Bull Riot Fest because of a partnership with the energy drink announced last year, is set for Wednesday, October 5, through Sunday, October 9. The festival has grown substantially in its short history including the adoption of a multi-venue system and big names in punk music including Bad Religion, Circle Jerks and Chicago punk legends Naked Raygun who permanently reunited after their 2006 Riot Fest performance. This year even saw Riot Fest expand to Philadelphia, PA, for a one-day event titled Riot Fest East. 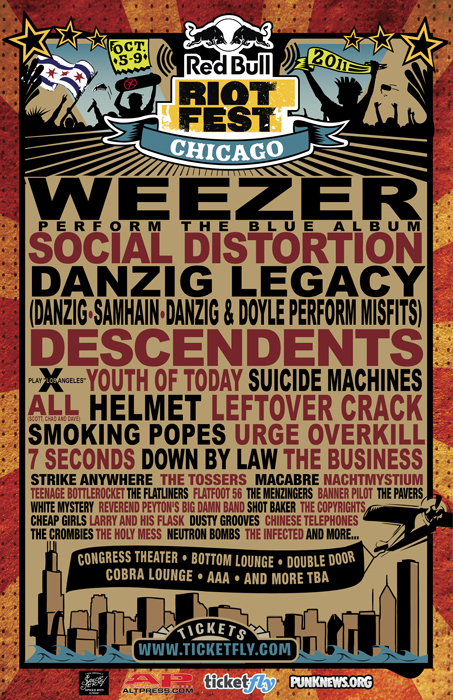 This year finds Riot Fest is bigger than ever with a lineup that includes punk rock mainstays such as influential outfit Social Distortion, former Misfits frontman Danzig and American punk originators X, who will perform their landmark album Los Angeles in its entirety. Additionally, the Riot Fest is branching out with more hard rock groups including Helmet and Chicago’s Urge Overkill. But a major departure from its punk rock roots can definitely noticed in this year’s headliner, Weezer. The “Buddy Holly,” power pop superstars will close out the Riot Fest 2011 on Sunday, October 9, at Chicago’s Congress Theatre. Other local venues hosting Riot Fest shows include the Double Door, Bottom Lounge, Cobra Lounge, AAA Warehouse and more.